These NSP Chinese Herbal Combinations are in my opinion the very best we have to offer. This page offers very efficient answers to many health related problems! The TCM formulas are 5 times more powerful than the regular product. So if you have a severe issue, select the TCM formula. When taking a TCM formula... no more than 1 capsule or 1 x twice a day with food is suggested. People in modern society place a lot of faith in modern medicine. Yet, half of all new drugs that are introduced into the marketplace are recalled within 10 years due to dangerous side effects. The fact is that modern medicine has been around for less than 200 years, whereas there are traditional systems of medicine that have been around for thousands of years. Traditional Chinese medicine (TCM) is one of the two oldest established paradigms of medicine in the world. It has developed through nearly 25 centuries of observation, practice and refinement to become one of the most sophisticated and side-effect free systems of healing on the planet. Steven Horne has served as the President of the American Herbalist Guild for three years. He is a gifted teacher and has an eloquent way of taking complex system ideas and questions and making them very easy to understand and from that we have benefitted greatly. He has studied these Chinese herbs for years... even in China! Steven visited Main land China when NSP was first coming out with their Chinese formulas and was there for three weeks for a terrific learning experience. During a conference call, Steven shared with us how his family and clients use the NSP's Chinese formulas. Instead of trying to explain the Chinese philosophy, he presents these formulas more in line with how we would think about herbalism using the body systems approach. In Chinese medicine they recognize there is a relationship between kidneys and bones. We know this from pH work (Acid-Alkaline) that there is a relationship here because one of the primary jobs of the kidneys is to flush acid waste. Acid waste is a byproduct of metabolism and whenever our body is converting nutrients to fuel to energize the body it is producing acid and the byproduct of that. The acid needs to be filtered out of the blood by the kidneys. If the kidneys are weak then they may not filter this acid out very effectively. When this happens the body borrows magnesium and potassium from muscles and calcium from the bones to buffer the acids in our body. This causes the person to have problems with muscles and bones. KB-C which strengthens the kidneys, is also used for things like weak knees and ankles, lower back pain, osteoporosis, arthritis. Helps with people who have a tendency to have kidney stones, slows down kidney failure. Known as the Herbal Chiropractor. Many people who have chronic back pain, have problems holding chiropractic adjustments, because they are not holding onto those minerals. KB-C helps the body to hold onto those minerals better and helps the body to maintain normal pH by helping the kidneys to flush acid more effectively. Works well with anyone who holds onto uric acid, and who are prone to lower back pain. Cleanser - for water retention where the kidneys need to be stimulated to flush fluid out - suffering from water retention. There is a lot of emphasis in Chinese medicine about the Liver. The Liver builds the blood - Liver stores extra blood and releases it into the circulation as it is needed when there is a demand. The liver is the major organ that helps to process the food substances coming from the digestive tract. If a person has a blood deficiency it is usually a sign that the liver is not working very well. The liver performs over 500 functions, including purifying the blood and assisting proper digestion. The Chinese believe that the liver is the home of the soul, and therefore, the most important organ in the body. A Chinese herbal doctor drew upon respected Chinese herbal lore to design this unique formula to "cool" a stressed liver and to encourage an overall sense of well-being. This formula is a blood tonic and contains the major tonic herbs typically given to women during their childbearing years in TCM. It helps increase blood volume and flow, combats anemia, scanty menstruation and fatigue. It can also help to resolve menstrual problems and PMS, as well as helping to reduce high blood pressure, blood sugar and cholesterol. Acute digestive upset - clears gas and undigested food from the stomach and intestinal tract - for when a person is acutely bloated, has foul belching from intestinal tract, gas, acute indigestion. This formula stimulates the body to expel the gas from the colon, stimulates the digestive function to work better, flush the irritating substances which weren't digested properly from the digestive tract. 2. For people who tend to be pale, often thin, cannot gain weight no matter what they do. Many people have the opposite problem. Stomach becomes weak and atrophied and many times do not show any symptoms at all as far as the digestive system goes (i.e. no gas or belching) but they just are not assimilating nutrients well. The way to recognize this is that people tend to be pale, often thin, can't gain weight no matter what they do. Tall and skinny and no real muscle mass on their body. In Chinese medicine they call this spleen deficiency. This is where the body doesn't have the ability to transform the food you eat into muscle tissue. Spleen Activator activates the energy of the digestive system and helps to build it up when a person has this digestive system weakness. This formula is beneficial for older people who are beginning to waste and loosing muscle mass and loosing body weight because they are no longer processing or digesting food very well. Also people who are overweight, who have a high percentage of body fat, low percentage of muscle, and who are wasting away and not developing muscle. Nervous system and Adrenals 1. When under acute stress, adrenals fire off their epinephrine and nor-epinephrine, adrenaline and nor-adrenaline, this gives a sense of anxiousness, feeling on edge and tensely alert, the fight of flight response where the sympathetic nervous system kicking in and the adrenals kicking out stress hormones. Chinese Stress Relief is a formula very similar to STR-C (available in Canada) or Nerve Eight (and to some respect the Nutri-Calm), these are nervine formulas that help to activate the parasympathetic nervous system and calm down the stress. Helps the body to relax and takes down the stress level. Reducing action. Nervous system and Adrenals 2. Helps to overcome adrenal exhaustion, muddled thinking, anxious, short term memory loss, confused, emotionally sensitive, won't sleep well, tired during the day (adrenal burnout), feeling exhausted - It can also be taken when a person wakes up at night and can't seem to go back to sleep. This tonic formula enhances the Shen or heart energy. Helpful for excessive stress and emotional "burn out." People who benefit from Nervous Fatigue Formula are typically tired and nervous, have difficulty sleeping, feel overwhelmed, vulnerable and "broken hearted", and lose sexual desire. They may also experience night sweats, have muddled thoughts, be emotionally sensitive and suffer from mental confusion and short-term memory loss. Nervous Fatigue Formula can help to enhance energy, improve sleep, aid mental function and reduce the body's response to stress. The key tonic herb in this formula is schizandra fruit, which is a tonic for qi, Shen and jing. Schizandra is an adaptogen with hepatoprotective properties. It calms the Shen, relieving insomnia, heart palpitations and impaired memory. It tones the jing to prevent night sweats and frequent urination. It is also helpful for dry cough, asthma, improving athletic performance and protecting the heart from oxidative stress. Nervous Fatigue also contains the tonics dong quai, astragalus and Korean ginseng. ALJ also improves lymphatic flow, digestion and circulation. Often seems to give a feeling of well-being. Breath Activator TCM: This formula supports the body in the battle to remove toxins from the entire respiratory tract, especially the lungs. Its primary herbs— citrus and schizandra—support the body’s efforts to clear waste from the respiratory system and enhance energy in the lungs. Lung Support is a qi tonic that primarily acts on the lungs, but also benefits the immune system. It is useful for people who suffer from chronic infections of the lungs, frequent colds and flu, dry cough, tightness in the chest, shortness of breath, and general weakness and fatigue. It can also be helpful for chronic lung diseases, including emphysema, tuberculosis, chronic asthma or bronchitis, and lungs that have been damaged or weakened by smoking. People who are unnaturally thin, suffer from weak muscles and energy loss or who are pale with flushed cheeks may also find this formula helpful. The primary tonic in Lung Support is astragalus, which not only supports lung health, it also helps to boost immunity and act as an adaptogen. Lung Support also contains a superior tonic that aids the digestion and removes stagnation from the digestive tract. The formula also contains the tonic herbs Korean Ginseng, Dong quai and Schizandra. Dose is 3 capsules of the regular formula with each meal or 1 of the concentrate (tcm) twice daily. Energy that lifts the body (flows up the body), lifts the mood and spirit. When the uplifting energy sags or is deficient we become moody and depressed. This combination also helps with sagging organs (prolapses of the transverse colon), feeling heavy, sad, lethargic and weighed down. The Chinese have used this formula to treat depression, fatigue, insomnia, neurosis, tinnitis, postpartum depression, dysmenorrhea, morning sickness, menopause, lung congestion and premenstrual syndrome. This blend is a major tonic for both qi and blood, but also benefits Shen and jing, making a superior tonic for the entire body. It is used for people who have been run down and depleted by chronic stress or illness and is useful for people who feel exhausted and burned out, have extremely poor resistance to disease or are depleted from chemotherapy or radiation treatments for cancer. Trigger Immune enhances blood circulation and immune responses. reduces stress and helps the body repair following surgery, injury, long-term stress or prolonged illness. It contains many of the superior tonic herbs including astragalus, Korean ginseng, epimedium, eucommia, ganoderma, dong quai, attractylodes and schizandra. The many tonic herbs in Trigger Immune give it powerful nourishing properties for depleted or elderly people. IF-C or IF-C TCM (cleanses) works well in acute inflammation, and excessive heat. Works to clear the heat. Works on Acute inflammatory response like fevers, earaches, sore and bleeding gums, sore throats. VS-C capsules or VS-C liquid or VS-C TCM (builds) with chronic inflammation and heat. Reduces inflammation, cold sores, canker sores, low grade viral conditions, such as herpes virus. Chronic viral infections include flu, infectious hepatitis, Epstein Barr and herpes (including cold/canker sores). Dr. Xie feels it may benefit persons with chronic immune deficiency (including AIDS) and those who have had antibiotics prescribed to excess. VS-C stimulates the immune system, protects the liver and helps reduce glandular inflammation. Typical consumption ranges from 1 capsules twice a day for mild problems more a day for serious problems. VS-C TCM Concentrate, Chinese [Immune] contains the same herbs found in VS-C but in a highly concentrated blend. This immune-supporting formula is a combination that Chinese herbalists would describe as a "metal-enhancing" formula. These herbs create a favorable environment for microbial balance and overall health, support detoxification and promote a healthy respiratory tract. This is indicated when a person feels constantly thirsty, drinks lots of water, and urinates but is always thirsty, mouth dry, dry skin and eyes. Insulin resistance where cells have problems transporting toxins out of the cell and nutrients into the cell, because the cell membranes become hardened causing the transport systems not to work as well anymore. This is indicated when a person feels constantly thirsty, drinks lots of water, and urinates but are always thirsty, mouth dry, dry skin and eyes. Tissues aren't hydrating (not soaking up the moisture). The body is just flushing the water through. This may indicate high blood sugar. The high level of sugar in the blood causes the body to crave water to dilute the sugar down, and then flushes it out through the kidneys (beginning of diabetes). Also possibly the cells are not soaking up the water because the hormones from the adrenals which control the distribution of minerals and water are not working properly. HY- C helps the body to hydrate, causing the cells to begin to soak up the water, will quench the thirst. HY-C will help the cells to let go of toxins more easily. Improves uptake of the cells. Cordyceps is a tonic, which means it enhances the underlying reserves, giving it anti-aging and vitality strengthening properties. One study done on this herb suggested that it enhances production of mitochondrial adenosine triphosphate (ATP), the universal molecule that powers cellular functions. Research shows that cordyceps can enhance athletic performance, reduce fatigue and balance blood sugar levels, making it another useful tonic for people who have diabetes or metabolic syndrome. It enhances lung health and is a very useful tonic for anyone with chronic lung diseases like COPD and asthma. Dose is 2 capsules twice daily. This formula is to nourish the adrenal glands, balance the 12 Chinese acupuncture meridians and energize all five constitutional types. This tonic builds physical, mental and emotional energy that can be affected by the emotional stresses of daily life. Some of the Chinese herbs act in some energy channels; others act in all channels. Although Mineral Chi can be described as a tonic stimulating formula, it's also very good for stress. From a western medical point of view, it is a good adaptogenic tonic for people who are nervous, under stress or depressed. A special form of licorice is used in Mineral Chi called deglycyrrhizinated licorice or DGL that does not increase potassium excretion. 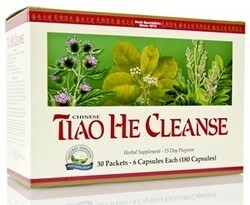 The Tiao He Cleanse is one of the best basic cleansing programs in the marketplace. It is not a harsh cleanse, but is still very effective. The Tiao He Cleanse gets its name from the Chinese herbal formula Tiao He, sold under the trade name Chinese Liver Balance. Tiao He means to "mediate harmony," referring to the formula's ability to harmonize the function of internal organs by helping to ease congestion in the liver. All Cell Detox, a general cleansing formula. It also features LBS II, a stimulant laxative herbal blend. Psyllium Hulls, a dietary fiber. Two single herbs, Burdock Root and Black Walnut Hulls ATC Concentrate, complete the program. Burdock root is a traditional blood purifier that has been used to clear up skin conditions and toxic conditions in the blood and lymph, including cancer. Black Walnut has antiparasitic and antimicrobial action.The Tiao He Cleanse not only helps improve colon transit time and clean out the colon, it also aids liver detoxification and improves kidney and lymphatic drainage. It stimulates digestion and even has a mild parasitic action. This 14-day cleanse contains convenient packets you can carry with you in your pocket or purse. It is even more effective if you add more fiber to the cleanse. Take 1-2 heaping teaspoons of a fiber blend like Psyllium Hulls Combination or Everybody's Fiber first thing in the morning along with a large glass of water. Taking an enzyme formula like Proactazyme between meals will also enhance the action of the cleanse. And, remember to drink plenty of water during the cleanse, at least 1/2 ounce per pound of body weight per day. In addition one should also consider repopulating the intestines with friendly bacteria such as Bifidophilus. 1. How about using Chinese formulas for Children? Children tend to have more of the acute stressed conditions instead of the chronic conditions. Children using Chinese formulas will usually use things such as VS-C.
VS-C is popular for Children as well as NSP's liquid herbs and chewable. However All Chinese formulas are basically safe for children in smaller quantities than recommended adult dosages on bottles. Each "TCM" capsule is equivalent to 5 capsules of regular Chinese combination. TCM denotes Traditional Chinese Medicine. Learn more about Chinese Herbs and Your "Elements" (Water, Fire, Metal, Earth, Wood, Metal).